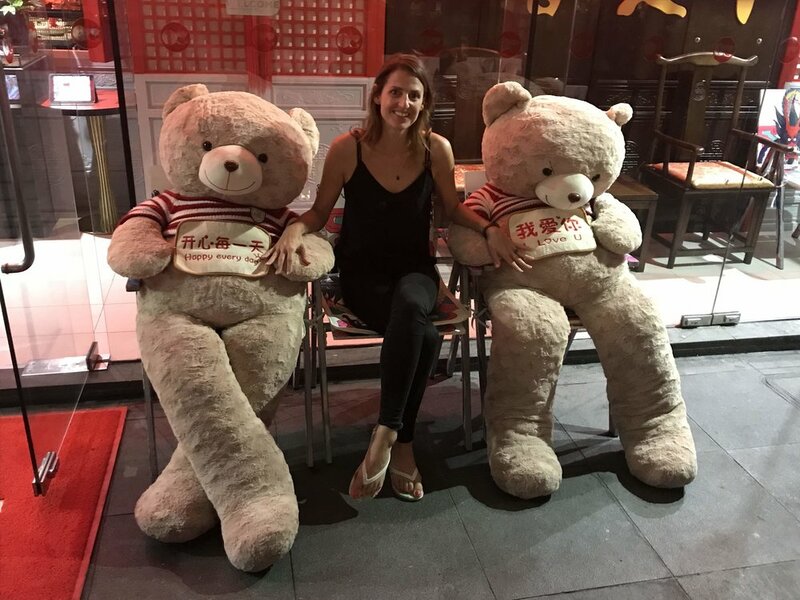 Stefje and I arrived in Singapore in the middle of the night straight out of China, but early the next morning we began our exploration of Asia’s premier city state by sampling two of the wide-ranging dining options: street hawkers and hip cafes. The cafe we walked into was worthy of Amsterdam coffee culture, both in terms of prices and poshness. Stefje eyed the cakes and pastries while I took greedy sips of a deliciously strong cold brew, a delicacy which I hadn’t had access to for months. Just around the corner from this hip cafe was a multi-story open air mall filled with an endless variety of street food hawkers. We enjoyed a delightful meal of curries while taking in the unique atmosphere and scents of this global mix of people. To take in the city, we took an immensely long walk down to the Bayfront neighborhood. The streets were wide and quiet, and even when filled with traffic there was no honking and still plenty of greenery to observe. As we made our way from the residential area to the financial district, large art installations began popping up everywhere, including a smattering of silver balls which reflected our image into more than 2 dozen vantage points. By the time we reached the Bayfront neighborhood, there was a scene of impeccable beauty to behold. Waterfront bars looked out over the harbor, and we took an elevator up to Level 33, the highest of all these bars to take in the views alongside the happy hour crowd from some of the many nearby offices. As the sun set across the horizon on a beautiful day, we made our way beneath the Marina Bay Sands, easily the city’s most striking hotel, to the Gardens by the bay. A unique combination of modern electricity and jungle foliage, the park was filled with locals and travelers alike for the Friday night light show. While the trees above us illuminated the night sky with lights that worked in concert with a crowd-pleasing sound track, we lay on our backs and took in the wonderful sight of a city coming alive. On our second day in Singapore, Stefje and I took a cab to the outskirts of the city center and got off at East Coast park, where a long stretch of greenery and sand accompanied us for a long walk along the water. Locals out early on a Saturday morning were biking, roller blading, and jogging along the long thin track of the park. Trees lined the way, providing shade from the oncoming humidity and a cool breeze came in off the water to make us feel plenty relaxed by the surroundings. As we approached the center of the park, families abounded with games, tents, strollers, and plenty of food to occupy their afternoon. Meanwhile, we were happy to scramble up a rocky pier and enjoy the feeling of sunlight on our skin. In the afternoon we made our way to the hipster neighborhood of Singapore, which was highlighted by a bookstore sporting plenty of local authors, hip brunch cafes, and plenty of coffee shops serving up soy cappuccinos and chocolate croissants. It was a happening neighborhood, but still quiet and serene; Singapore in general has very little background noise and clean, spacious walkways between blocks of densely populated apartment buildings. In the evening we worked our way down to Clarke Quay, a riverside promenade replete with bars, restaurants, and endless entertainment options. The atmosphere was intensely touristic, but it was enjoyable to have a stroll around and observe the nightlife of the city. At the nearby Boat Quay neighborhood, we found a relaxed bar with an outdoor pool table and posted up with PBR’s, happy to watch the endless parade of pedestrians come strolling by. While locals and western expats brushed shoulders in the bar, it became apparent that Singapore is a true melting pot of cultures. Reflecting on the day, Stefje and I noticed that we had see books written in Mandarin, Muslim women shopping for produce in headscarves, Indian construction workers, and massive Christian churches in just a small slice of the city. On our last day in Singapore, we were ready to see a little more of the city’s natural beauty; a bus took us outside of the city center to the nearby MacRitchie Reservoir Park. 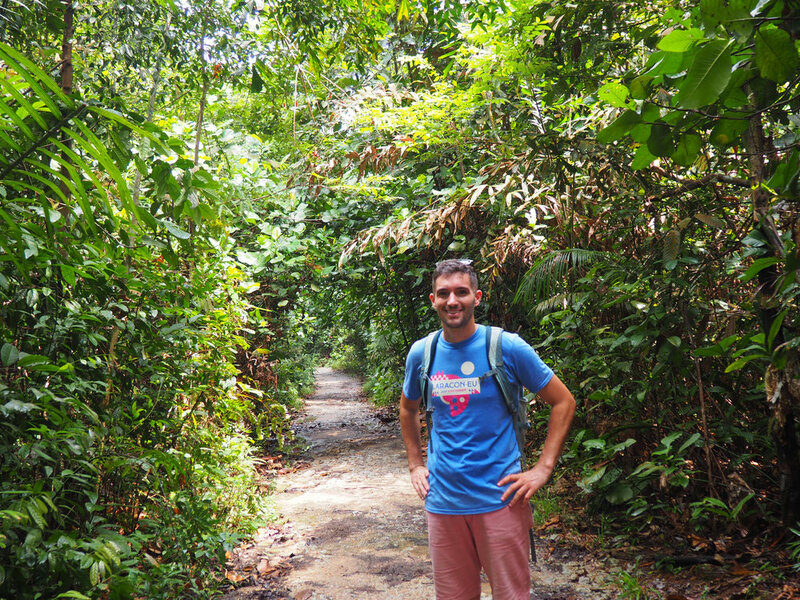 Following a trail that circumambulates a large man-made lake, we were quickly immersed in the tropical jungle. A wide diversity of trees formed a shady canopy that protected us from the sun, but nothing could save me from quickly spouting rivers of sweat. Along the way we glimpsed a few signs of the island’s wildlife: monkeys, lizards, and butterflies were all visible to a discerning eye. However, the real focus of our attention was the tremendously abundant vegetation. Huge palm fronds soaked up the sun’s rays, vines wrapped around trunks, and trees pushed upwards in the ceaseless competition for nutrients. As enjoyable as the forest was, our mood was soon tempered by the difficulty of the uphill hike. Although dozens of locals ran past us on the trail, Stefje and I were equally unaccustomed to the think humidity and felt like we were walking through a sauna. With weary legs and light-headedness, we pushed to the top of the trail, which included a walkway built above the canopy of the forest. This spot offered spectacular views of the natural growth going on all around us: trees of all shapes and sizes spread their leaves in hopes of obtaining some precious water and sunlight. Although deep rolling rumbles of thunder and a few light showers had threatened all morning, the view was all clear from the top. Even the stagnant heat of the forest floor gave way, replaced by a cool breeze which gave us some relief from the sweaty hike. We did our best to linger at the top, then slowly made our way back along the lakeside, skirting along a few holes of Singapore Country Club’s golf course. By the time we made it back to the park entrance, we were greatly in need of some shade, a cool drink, and a long session of sitting in an air-conditioned bus. A few hours later we were on our way to the Singapore airport, happy with our chance to catch a small taste of this diverse and intriguing city.